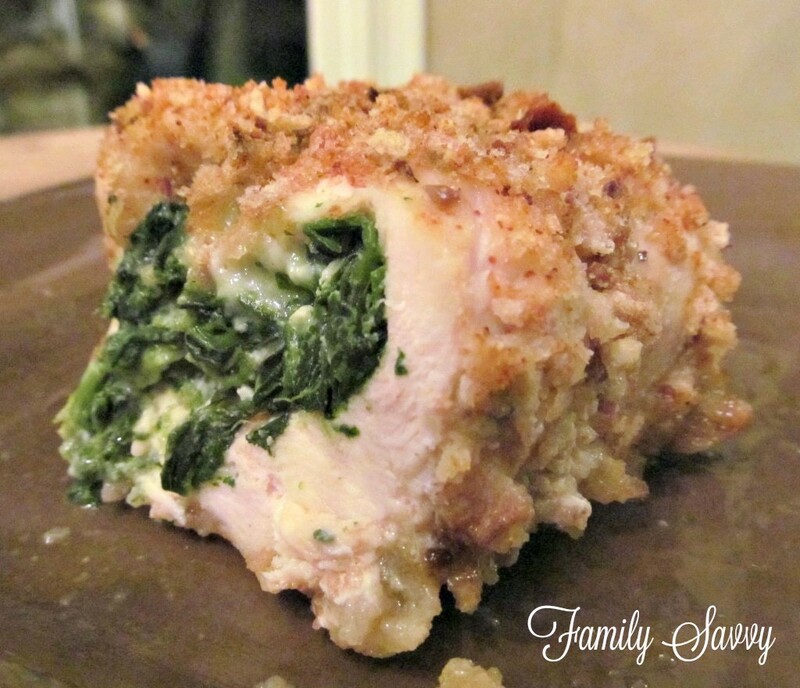 Chicken, spinach & pepper jack roulades are thin chicken breasts wrapped around a spinach pepper-jack cheese filling and baked in a breadcrumb coating. This roulade is SO delicious, and it makes an impressive entree to serve at a special meal or for company. This is one of my favorite ways to use boneless skinless breasts. This chicken roulade isn’t difficult to make, but it does take a bit of time to prep the chicken before baking. A few tips can make the process much easier. First, get the breasts as thin as possible. I buy fresh boneless skinless breasts, butterfly them (cut in half lengthwise), and pound the halves with a meat mallet. To keep chicken juice from splattering everywhere, I place the chicken in a huge ziploc bag. I pound one or two breasts at a time, and try to get them as thin and uniform as possible so that they will all cook evenly. A good meat mallet should pound meat without tearing it to shreds. I use the Norpro Grip-EZ Meat Pounder. This is Cook’s Illustrated top rated meat pounder based on their kitchen equipment tests. Second, arrange all ingredients in order on the counter. I place everything in a row~the breasts, the spinach-cheese mixture, the EVOO, the breadcrumbs, and the toothpicks. I have the baking dish at the end of the row so that I can place the roulades in it as soon as I get them secured with toothpicks. Third, have a good meat thermometer on hand. It is important to check the internal temp of the roulades before removing them from the oven. Test the largest roulade and cook until it reaches 165 degrees. Chicken will continue to cook after removing from the oven and allowed to sit. I use the CDN ProAccurate Quick-Read Thermometer and keep at least two on hand. I never feel comfortable cooking meat without a good read on the temp. Note on ingredients: Boar’s Head Monterey Jack with JalapeÃ±o is hands down the best pepper-jack I’ve ever found (and is Cook’s Illustrated recommended, with Tillamook a close second). It is in the deli case where Boar’s Head meat is sold. As for the breadcrumbs, I always buy Panko, and three brands recommended by Cook’s Illustrated taste tests are Ian’s, Kikkoman, and Progresso. I get the plain, as they can always be seasoned according to specific recipes. If you have bread (artisan or bakery) that is days old, you can make your own breadcrumbs (recipe below). Make Ahead: These can be fully prepped and assembled in the baking dish early in the day (or a day ahead). Keep in the fridge and remove half an hour before baking. Bake as directed. If you give these roulades a try, please let me know how they turn out for you! As always, thanks so much for stopping by. Be blessed, and stay savvy!!! Thin chicken breasts rolled around a pepper-jack cheese & spinach filling, coated with breadcrumbs, and baked until done. Delicious! Line 11 x 13 baking dish with aluminum foil or parchment (for easy cleanup). Lay out pounded chicken breasts and sprinkle with salt & pepper. Heat both boxes of spinach in microwave until no longer frozen, about 4 minutes each. Squeeze liquid from regular spinach until it is as dry as possible. In medium bowl, mix creamed spinach, regular spinach, and pepper jack cheese. In small bowl, mix breadcrumbs with 1 TB Cajun seasoning. Lay toothpicks (lots of them) out so that they are easily accessible; you'll be reaching for these as you roll the breasts. 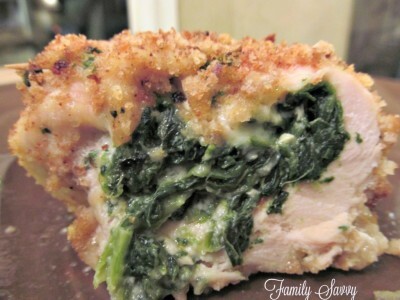 Place spinach/cheese mixture in the center of breast. Roll breast around the mixture, securing with toothpicks (it takes 6-8 per breast). Brush breast with EVOO, and roll in breadcrumbs, covering as evenly as possible. Bake chicken until largest piece registers 165 degrees with an internal thermometer. This takes approximately 45 minutes.